As promised, I've found another higher priced, less volatile play that has been consolidating nicely over the past few months and I think could be ready to move higher. 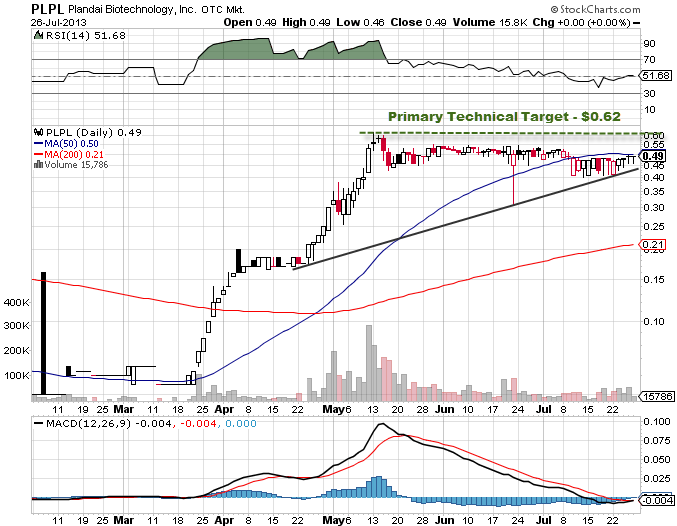 They say a picture is worth a thousand words, so the best way to explain the trading opportunity in Plandai Biotechnology, Inc (PLPL) is by showing you the extremely strong chart. You can see PLPL has been trading in a tight range over the past few months, and with the exception of one day where it dipped (but immediately bought straight back), it has amazingly strong support at these levels. And just over the past few days there has been a gradual move higher from around $0.40 to $0.49. I think PLPL is poised to break out of this trading range soon. And when it does, the obvious technical target is its recent high of $0.62. A move to this level would represent a 26.5% gain from Friday's closing price. Of course if we break about previous highs, all bets are off as to how high it could go. But given PLPL is a much less volatile play than we typically profile, with a strong risk/reward profile and strong technical support, it looks like a very strong trading set up. Of course this many take more than one day to move, and we ask for some patience for the breakout to play out. It's not all just about the technical's either. PLPL has been creating some buzz for a while now, and it is easy to see why when you take a look at some of the recent press. 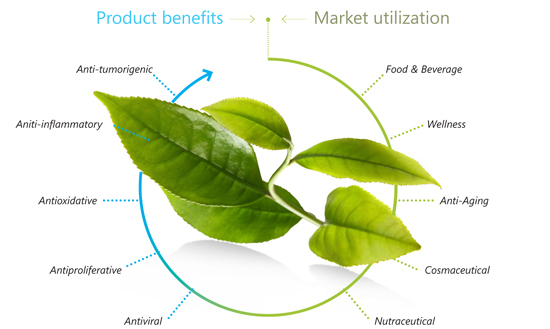 Plandai Biotechnology (PLPL) intends to transform the world of nutraceuticals and is the culmination of over ten years of research in the field of plant extracts. Its principle holdings consist of land, farms and infrastructure, totaling more than 8500 acres, in the province of Mpumalanga, South Africa. This Seattle based biotechnology firm uses a proprietary process that is dramatically improving the bioavailability of their compounds through molecular changes to the live botanicals themselves. PLPL controls every aspect of the process, from growing the raw materials on its farms in South Africa, to producing its patented Phytofare(TM) extracts in-house, allowing the Company to guarantee the continuity of supply as well as quality control throughout the entire process. Targeted industries for the Company's products include food and beverage, cosmeceutical, wellness, nutraceutical, anti-aging, and pharmaceutical. The company's patented hydrodynamic sheering process through which live plant-materials are converted at the molecular level during extraction into a nano-particle structure that mimics that found in human tissues. Where most botanical products have less than 10% absorption, according to the company and documented research, Phytofare(TM) is clinically proven to have far superior absorption. Higher bioavailability translates into the ability for users to receive a clinical dose with lower quantities. By definition, when a medication is administered intravenously, its bioavailability is 100%. When a medication is administered in any other way, orally for instance, its bioavailability generally decreases due to incomplete absorption and may vary from patient to patient. Bioavailability can be defined as a measurement of the amount of any compound to be absorbed into the bloodstream. In short, Plandaí takes the good, removes the bad and amplifies the benefits of nutrients to manufacture better food and drinks through better technology. PLPL has collaborated with some of the biggest and brightest minds in the food and beverage industry. According to the Company, PLPL will look to introduce 3 separately branded extracts that will offer customers the high bioavailability that its patented technology can provide. Addressing a number of the most talked about areas in the industry, these extracts will look to offer preventative and inhibitive options for: cancer prevention, anti-viral protection, anti-inflammation, antioxidants, weight loss, high blood pressure, and sports injury recovery. With an extremely bullish chart, plenty of positive PR hitting the wires and investor buzz circulating, we think members should take a serious look at PLPL at these levels, in anticipation of another strong move higher. As always, I will keep you up to date with any further developments as they come to hand. Pennystocksgonewild.com may receive compensation and its employees and affiliates may own stock that they have purchased in the open market either prior, during, or after the release of the companies profile which is an inherent conflict of interest in Pennystocksgonewild.com statements and opinions and such statements and opinions cannot be considered independent. Pennystocksgonewild.com and its management may benefit from any increase in the share price of the profiled companies and hold the right to sell the shares bought at any given time including shortly after the release of the companies profile. PSGW has been compensated two thousand dollars by Cream Consulting for this one day profile of PLPL. PSGW has previously been compensated two thousand dollars by Cream Consulting for a one day profile of PLPL which has since expired.